Outstanding medical debt has become a common theme among personal bankruptcies in America, according to a March survey in the American Journal of Public Health - with nearly 60% of people admitting a medical expense "very much" or "somewhat" contributed to their bankruptcy - more than the percentage who cited home foreclosure or student loans. As The Atlantic's Olga Khazan notes, this "uniquely American phenomenon" is due to a number of factors, including an increasing lack of insurance, crappy high-deductible insurance, and a woefully erroneous medical billing system. In other cases, hospitals required by some states to provide charity care to certain low-income and uninsured patients have been caught sending out regular bills instead. "We were seeing hospitals sending debtors to debt collections without saying anything to the debt collectors," said Emilia Morris - legal direct of Central California Legal Services. "The debt collectors are trying to collect these debts without making charity care available. The patient sometimes gets sued, gets a judgment entered against them, without ever having heard of charity care." Despite the financial assistance, around 20% of Americans have a medical claim on their credit report, and around the same proportion have an overdue medical bill. In fact, the Consumer Financial Protection Bureau (CFPB) reports that medical bills are the most common cause of unpaid bills sent to collection agencies. 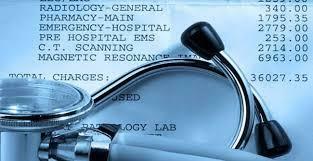 The most common cause of large medical bills? Emergency-room visits and planned surgical procedures that patients can't afford to pay, according to advocates. In many cases, a hospital may be covered under a patient's insurance network, but the individual doctors who work there and the ambulance provider aren't - often leading to "balance billing" in which patients are billed for the amount insurance will not covered. Consumer advocates tell The Atlantic that patients should ask about financial assistance - including charity care for the uninsured. If that fails, patients can ask whether they can pay whatever the hospital would have charged someone who was on Medicare—typically a lower rate. Hospitals and even collections agencies will often agree to payment plans, or a discount in exchange for a lump-sum payment. Small outstanding medical debts are now getting sold to debt buyers - who try and collect as much as possible on long past-due debts. "Now we are seeing small-time medical practices get involved in selling their bad debts to debt buyers for pennies on the dollar," says Simon Sandoval-Moshenberg - legal director at the Legal Aid Justice Center, who adds that at the end of the day, a person who is at imminent risk of having their wages garnished because they've been sued for medical debt may find the best course of action to declare bankruptcy.